« Little Village "Little Village"
The year was 1971 and singer songwriter Joe Ely, Texas National Treasure, and once considered to be the musical heir apparent to fellow Lubbock resident Buddy Holly, was driving on the outskirts of town when he spotted on the horizon a straggly Howard Hughes looking dude, wearing a back pack, wandering on the shoulder of the main road leading into the city. Ely pulled over and offered the travelling stranger a ride to the other side of town. As a kind gesture to thank him, the stranger reached into the back pack, pulled out one of the fifteen albums that resided there, no clothes no nothing, just more than a dozen copies of the Townes Van Zandt album Our Mother the Mountain, and presented the record that included “Be Here to Love Me”, and “Tecumseh Valley”, two songs that would become standard bearers for the Townes Van Zandt canon and beloved by song writers of any genre, to his generous benefactor. This was the first time that Joe Ely met Townes Van Zandt. 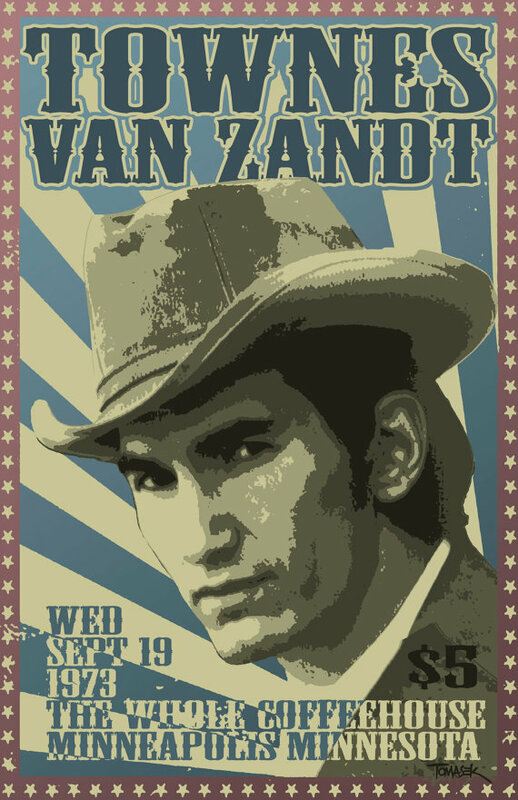 Wandering minstrel, traveling troubadour, road warrior, all of these characterizations seemed to fit Van Zandt as he was traveling on foot, sometimes hitching a ride benefiting from the kindness of strangers, destination, Houston Texas and The Old Quarter Acoustic Café. It was here, in what was quickly becoming in the early 1970’s a must hear destination for acoustic music fans, and a mecca for the folk and acoustic blues scenes as well as an important platform for promoting the new Outlaw Country movement that was starting to sweep the country, that Steve Earle met Townes Van Zandt. Earle, a fresh-faced kid 17 year aspiring singer-songwriter was in the middle of a set when a somewhat inebriated heckler yelled from the audience that if Steve wasn’t much of a country player if he could not play “Wabash Cannonball”. Despite his tender years, Earle was very much aware of the players on the singer-songwriter scene and was acutely aware of the massive talent, soul searing lyrics, and intricate chord progressions that belonged to this particular heckler that turned out to be Townes Van Zandt. Without missing much of a beat, instead of playing the classic somewhat overplayed song that the heckler requested, Earle effortlessly transitioned into a note perfect rendition of “Mr. Mudd and Mr. Gold”, a lyrically dense song with several complex chord changes that Van Zandt had written and was as part of his set list when performing his own shows in venues across the Southwest including The Acoustic Café. 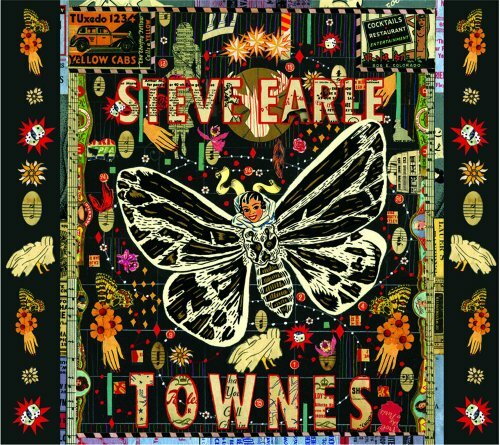 The idolatry that Steve Earle held for Townes van Zandt extended into performing a lot of his songs in his live performances, writing the song “Ft. Worth Blues” as a tribute to his hero after his death of a heart attack in 1997, lovingly naming his son Justin Townes Earle (a brilliant artist, composer, and performer in his own right) after his fallen idol, and ultimately into releasing an album filled entirely with his songs entitled simply Townes. 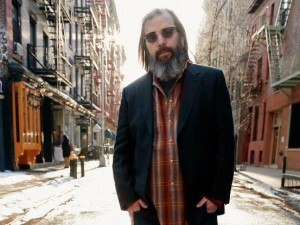 Steve Earle isn’t the only artist that has embraced Townes Van Zandt, the list is a long one including The Cowboy Junkies, Lyle Lovett, Conor “Bright Eyes” Oberst, and Willie Nelson, but none of these would have been capable of creating a record with the same kind of passionate reverence that Steve Earle could produce. Trying to emulate the sometimes sparse live performance settings where the original songs were displayed the early works were selected from a period in the early 70’s that most people consider to be Van Zandt’s glory years. Taking care of the elephant in the room first, the album opens with “Pancho and Lefty”. Holding much closer to the pacing and the delicate phrasing of the original rather than the slighter faster tempo version made famous by Willie Nelson and Merle Haggard, the song seems to have a much more bleak tone than the Butch Cassidy and the Sundance Kid or Thelma and Louise romp feeing of the original. “White Freightliner Blues” gets a banjo bluegrass treatment and the aforementioned “Mr. Mudd and Mr. Gold” is a breathtaking duet with some familial chorus swapping with his son, Justin Townes Earle, and is probably the highlight of the album. The best way to experience a Townes Van Zandt album is to listen to it with the lyrics in front of you and follow along with the verses. “Lungs” is that sort of a song . After listening to this song I gave a turn to the better in a different way Lyle Lovett Version. Well won’t you lend your lungs to me mine are collapsing/Plant my feet and bitterly breath up the time that’s passing/breath I’ll take and breath I’ll give pray the day ain’t poison/Stand among those that live in lonely indecision. “No Place to Fall” along with “The Tower” is an all-time favorite and Steve delivers a tingling version with a mournful accordion accompaniment with “Colorado Girl” a nice” just a guy and his guitar song” that seemed to set me at peace after a couple of re-listens. While the album doesn’t contain some of my later year favorites like “For the Sake of the Song”, the exquisitely crafted “Tecumseh Valley”, or the sparsely beautiful “Flyin’ Shoes” Townes does serve as an excellent Townes Van Zandt primer. But consider yourself warned, as Steve Earle himself will tell you. Townes Van Zandt may be a brilliant artist, but he is not very good as a role model. A couple notes. Townes won a Grammy for Best Contemporary Folk Album. The cover art was once again created by Tony Fitzpatrick. All songs written by Townes Van Zandt except where noted. I haven’t heard this album yet. I love Mr. Earle. I own 15 of his albums and he’s an American icon. What truly makes him great is his story telling ability. I also admire his role in speaking up on social/political issues. A true Woody Guthrie of our time. 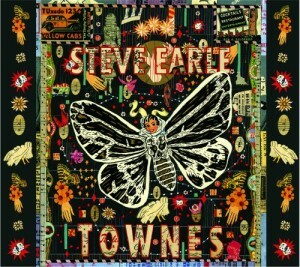 Love Steve Earle. Love Townes Van Zandt. i really should like this album more but i don’t. There’s a spark missing , i’ve rarely played it since i bought the damn thing. Oh well. A fine write up by Walt though. •posting here cos i don’t like negative feedback on the FB page , it’s for positive thoughts ! “i’ve rarely played it since i bought the damn thing.” — maybe that’s the problem? I remember listing to Levon’s Dirt Farmer twice then after putting it down for 3 months it became my album of the year.